﻿Published by Sareth Ney on Nov. 21, 2017 at 12:46 a.m.
ST. AUGUSTINE, Fla. – The Psychic Warfare World Tour 2017 featuring Clutch, Devin Townsend Project and The Obsessed will be making a trek stop at the Backyard Stage at The St. Augustine Amphitheatre, on Dec. 5. The expedition begins on Nov. 29 at the Cone Denim Entertainment in Greensboro, N.C. It concludes on Dec. 31 at Express Live in Columbus, Ohio. Neil Fallon (vocals, guitar), Jean-Paul Gaster (drums), Dan Maines (bass) and Tim Sult (guitar) are Clutch. Clutch’s discography including: “Pitchfork”, “Passive Restraint EP”, “Transnational Speedway League: Anthems, Anecdotes”, and Undeniable Truths”, “Clutch”, “Impetus”, “The Elephant Riders”, “Pitchfork”, “Jam Room”, “Pure Rock Fury”, “Slow Hole To China: Rare and Unreleased”, “Blast Tyrant”, “Robot Hive/Exodus”, “Pitchfork & Lost Needles”, “From Beale Street To Oblivion”, “Strange Cousins From The West”, “Earth Rocker”, “Live at the Googolplex”, “Pigtown”, “Live in Flint, Michigan”, “Live at the 9:30”, “La Curandera”, “Full Fathom Five”, “From Beale Street To Oblivion”, “RSD Split” and “Psychic Warfare”. Devin Townsend (vocals, guitar, keyboard, programming), Ryan Van Poederooyen (drums), Dave Young (guitar, keyboard), Brian “Beav” Waddell (bass) and Mike St. Jean (keyboards, synths, programming) are the members of Devin Townsend Project. Since April of 1995, Townsend has been a part of 30 releases. In May of 2009, The Devil Townsend Project released their first, “Ki” (May 2009). It was followed by: “Addicted” (Nov. 2009), “Deconstruction” (June 2011), “Ghost” (June 2011), “By A Thread - Live in London” (June 2012), “Epicloud” (Sept. 2012), “Z²” (Oct. 2014) and “Transcendence” (Sept. 2016). “Transcendence” had two discs and 21 songs. Scott “Wino” Weinrich (vocals, guitar), Brian Consatino (drums) and Reid Raley (bass) are The Obsessed. Weinrich formed The Obsessed in 1976. They have released records, live albums, EPs, splits, promos, demos, bootlegs and videos consisting of: “The Obsessed” documentary, “Demo 1982”, “Demo 1980”, “The Obsessed Unreleased LP”, “To Protect & To Serve”, “Streetside/Blind Lightning”, “Concrete Cancer Feelingz Mental Hiding Masque”, ‘Live at the Wax Museum”, “The Mystick Krews of Clearlight”, “Altamont Nation”, “The Obsessed” (1990), “The Obsessed” (1983), “Incarnate”, “Live Music Hall Köln December 29th 1992”, “Live at the Melkeg”, “Lunar Womb”, “The Church Within” and “Sacred”. 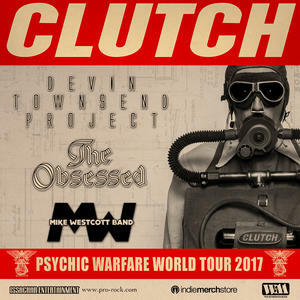 ​Advance tickets to attend the Backyard Stage at The St. Augustine Amphitheatre stop of the Psychic Warfare World Tour 2017 featuring Clutch, Devin Townsend Project and The Obsessed are $27 each. They will be $30 on the day of the show, are general admission standing only and exclude fees. Nov. 29 - Cone Denim Entertainment, Greensboro, N.C.
Dec. 1 - House Of Blues, Myrtle Beach, S.C.
Dec. 2 - Revolution, St. Petersburg, Fla.
Dec. 3 - Revolution, Ft. Lauderdale, Fla.
Dec. 5 - Backyard Stage at St. Augustine Amphitheatre, Fla.
Dec. 6 - Vinyl Music Hall, Pensacola, Fla.
Dec. 8 - Varsity Theatre, Baton Rouge, La. Dec. 12 - Gillioz Theatre, Springfield, Mo. Dec. 13 - Bourbon Theatre, Lincoln, Neb. Dec. 16 - Marathon Music Works, Nashville, Tenn.
Dec. 27 - Upstate Concert Hall, Clifton Park, N.Y.
Dec. 28 - Starland Ballroom, Sayreville, N.J.
Dec. 29 - The National, Richmond, Va.
Dec. 30 - The International, Knoxville, Tenn.